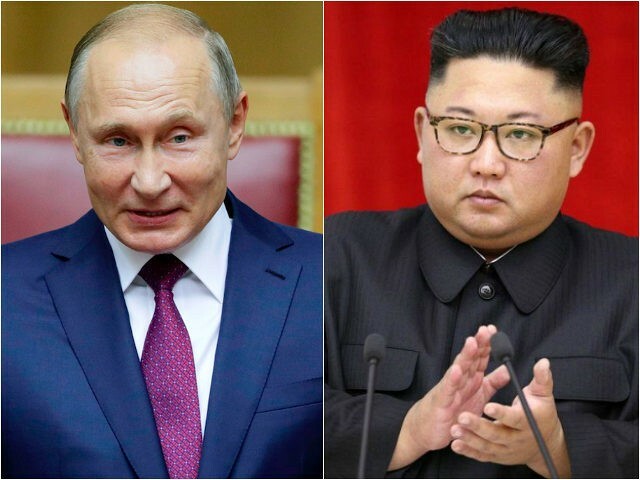 The South Korean newswire service Yonhap reports that North Korean dictator Kim Jong-un may meet Russian President Vladimir Putin for the first time next week as the latter travels east to China, the latest in months of reports that the two men have sought to schedule a summit. The report follows the departure of a Russian legislative delegation led by Duma Deputy Speaker Sergei Neberov from Pyongyang, where they sought to discuss strengthening ties between the two nations. During the visit, Neberov told the Russian outlet TASS that the Kim regime was interested in buying new Russian aircraft to use as part of its domestic airline. North Korea has depended on antiquated Russian technology for access to the skies for decades and has expressed interest in expanding its tourism sector, one of the few areas of the economy not under international sanctions. “Russian President Vladimir Putin is expected to make a trip to the Far East region around April 24 … Chances are fairly high that a summit between Russia and North Korea could take place around that time,” the “source” said. Yonhap adds that it received a confirmation from the Kremlin that both governments are working on the logistics for a summit between the two leaders, but Russian officials did not offer a direct response to the question of whether the two leaders would meet next week or not. Putin is scheduled to travel to eastern China next week for a forum on participating in its “One Belt, One Road” infrastructure program, seeking to connect western Europe to Beijing through a multi-million dollar network of roads, ports, and railways all controlled by the Chinese Communist Party. While Putin’s government has long remained skeptical of the expansionist policies of Chinese Communist Party leader Xi Jinping, the Belt and Road program may offer much-needed investment to the sluggish Russian economy. Putin issued an open invite for Kim to visit Moscow at his leisure in May, but Kim has yet to take him up on the offer. South Korean Ambassador Woo Yoon-keun told reporters in November that Putin hoped to have Kim visit Russia “within this year ,” but the visit never occurred. Instead, Kim took a gamble on a second summit with U.S. President Donald Trump in February, which ended abruptly with Trump walking out and declaring that Kim’s intransigence on calling for an end to sanctions made it impossible to negotiate. “Basically, they wanted the sanctions lifted in their entirety and we couldn’t do that,” Trump told reporters at the time. Yonhap claimed in its report Monday that North Korea “beefed up” diplomacy with Russia following its failure with Trump. In September, American Ambassador to the U.N. Nikki Haley accused Russia of “consistent and wide-ranging violations” of the sanctions at an emergency Security Council meeting. Haley identified 148 different examples of alleged violations. “Step by step, sanction by sanction, and time and time again, Russia is working across the board to undermine the sanctions regime,” Haley said, accusing Russia of “helping North Korea illegally obtain fuel through transfers at sea” among other attempts to strengthen the rogue Kim regime as reported by Reuters. Russia denied violating the sanctions but nonetheless insisted in “diplomacy” over sanctions to help Pyongyang come to the table. A month later, Secretary of State Mike Pompeo made similar accusations, saying “new, credible reports that Russia has violated U.N. sanctions” existed. Russian officials departing Pyongyang this week met with state officials in addition to participating in the mandatory worship of communist founder Kim Il-sung and visiting several manufacturing facilities in the capital, according to the North Korean state newspaper Rodong Sinmun. TASS published remarks from the leader of the delegation, Deputy Speaker Neverov, who said Russia may soon sell North Korea more airplanes.